Photo credit: DG Jones. Leave the Marantz at home, and fire this one up in your homebrewed tape mangler. No laptops. No CD players. No turntables. The Cassette Jockey World Championships will be cassette tape only. And the rules are tough: store-bought, commercial cassette tapes only. (Dig that Paula Abdul out of your closet — you know you want to.) Sounds dull? Think again: how you play those tapes is entirely up to you, and from what we’ve seen insane circuit benders and mad scientists of circuitry do to tape machines, that could get real interesting. It’s an open call — and if you think you’ve got what it takes to judge, you should get in touch, as well. Whether you’re going to the Maker Faire or not, I’ve also rounded up cassette tape creations from CDM stories past, just to get your tape juices flowing. at the Make Magazine Maker Faire! In 2003 at a festival in Chicago, a group of retro-tech geniuses organized The Cassette Jockey World Championships. Like the popular DJ (Disk Jockey) competitions with record-toting DJs showing off their turntable skills, the CJ Championships showcases skills and styles in the venerable world of cassettes. Since CJs were encouraged to hot-rod their own equipment, eviscerated boomboxes, disembodied tape heads, and overclocked Walkmans were the weapons of choice… anything that used the standard cassette as its ammo. Now, in 2007, we’re hijacking the battle and hauling it to the west coast! Forget DJs, this is for the CJs: The Cassette Jockey Championship is where YOU can show off your skills as a world-class CJ. This is your chance to show the world what the venerable and once-mighty cassette tape is capable of. The CJ who amazes the judges with their skill, technique, and knowledge will become the 2007 CASSETTE JOCKEY CHAMPION! 1. One (1) Cassette Jockey at a time – no teams. 2. Competitors are ENCOURAGED to create or alter their own cassette tape decks/players/recorders/etc. to compete on. However, some stock cassette equipment will be provided at the competition. 3. Standard cassette tapes ONLY – no mini-cassettes or 8-Track tapes. 4. 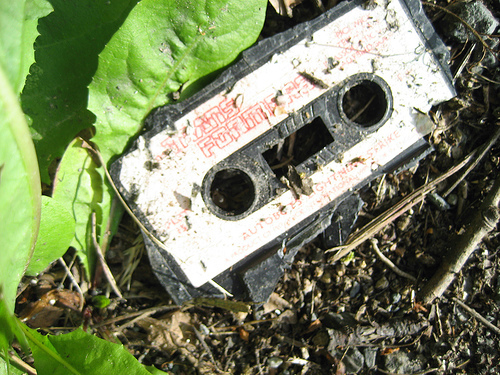 Cassettes used MUST be published, pre-recorded, “store-bought” cassettes for source material – No dubbing of CDs/LPs/8-Tracks/MP3s to tape, home recordings, battle cassettes, or found sounds are allowed. 6. Live microphone usage and live feedback are allowed. 7. Headphones are allowed (supplied by competitor). 8. Competitors may use no more than six (6) cassette devices. Competition will be Saturday, May 19, 2007 at the Maker Faire (admission/ticket required). The competition begins at 1pm with an Elimination Round, with each competitor given three (3) minutes to compete. Each will be scored by a panel of judges based on the criteria described below. The top five (5) scoring Cassette Jockeys will progress to the Final Round at 5pm. During the Final Round, each competitor is given five (5) minutes to compete. As before, each will be scored by the judges. The highest scorer is the winner, and receives a prize package and the title of Cassette Jockey World Champion! 1. (10 Points) Content. Techniques, musical ideas, and exploitation of the cassette medium. 2. (10 Points) Form. Performance style, transitions, overall set structure. 3. (5 Points) Intangibles. Bonus score for anything else the judge deems worthy.